The Tampa Bay Ship Model Society brings together model ship builders, both newcomers and veteran builders, for the mutual benefit of expanding their knowledge of ships, research, techniques, and further develop their abilities in all areas relevant to ship model building and maritime history. 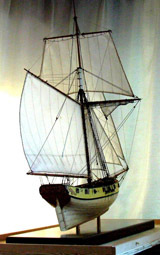 Members model in all materials; wood, metal, paper and polymers, from plans only, or commercial kits, vessels from every era and purpose; Exploration, Steel Navy, Submarines,Yachts, Tugs, Commercial, Fishing, Liners, Working Small Craft, Coast Guard, River/Paddle Wheel, Racing Power and Sail. Members of the Tampa Bay Ship Model Society work independently on vessels which interest them. Static display models, waterline dioramas, radio control vessels and half models of every era are represented. The club also welcomes marine artists, historians and authors. Professionally, members come from all walks of life, and are ever willing to share their techniques, sources and skills.